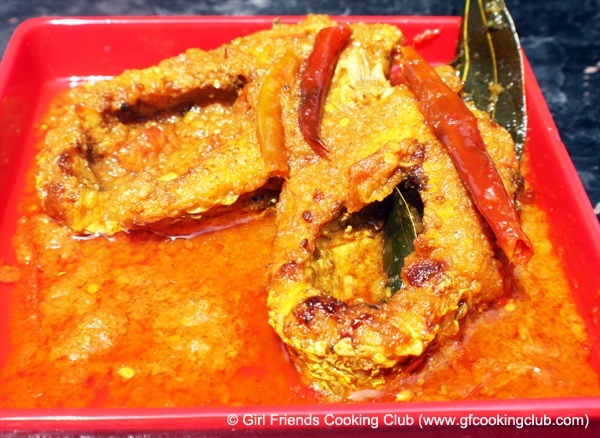 Wash and clean the fish fillet and marinate it with turmeric, salt and lime juice and keep it aside for 10-15 mins. In a non-stick pan, take 2 tbsp of oil and shallow fry the fish on both side on medium heat and keep aside. In the same pan, heat 3-4 tbsp of oil and add the whole red chillies and bay leaves. Saute for a minute and add the chopped tomatoes. Cook till the tomatoes become tender. Add the turmeric, salt and chilli powder. Add the onion,ginger and garlic paste and mix well. Cook for 10-15 mins till the masala is well done and the oil starts leaving from the masala. Add 1/2 cup of water and let it boil. Then add the fish fillet to the masala and cook for 5-10 mins till the fish gets nicely cooked and soaked into the masala and the oil separates from the masala. This entry was posted in Fish, Grand Ma's Recipes, Nepali Food Recipes and tagged Easy Recipe, Masala Fish, Nepali Cuisine, Nepali Recipes by Kamakshi. Bookmark the permalink.